Welcome back to Inside the Mind of a VC, a series of interviews in which we speak with Venture Capitalists. 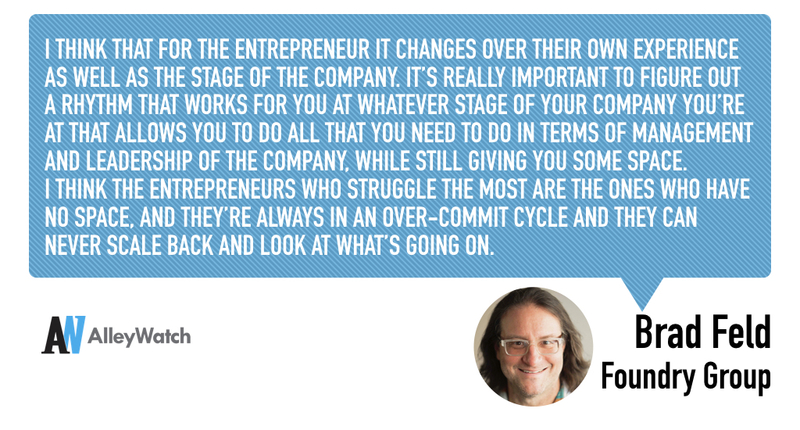 In the hot seat this time is Brad Feld, cofounder of Foundry Group and cofounder of Techstars. He is also the author of several books that are considered bibles for the betterment of the entrepreneurial and tech community. During his 20+ year career in venture, Feld has been one of the most influential investors whose candid approach has positively impacted millions in the tech ecosystem. We caught up with Brad to talk about his early days as an entrepreneur, start in venture, actionable tips for entrepreneurs, thoughts on diversity, love of tennis, and much, much more. 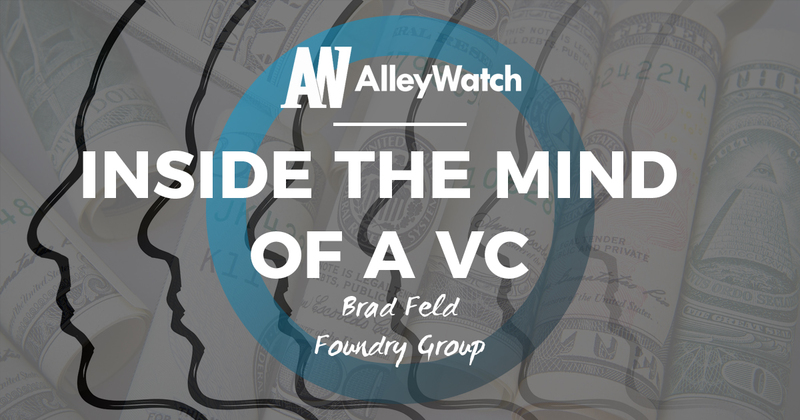 Bart Clareman, AlleyWatch: Tell us about your journey into the venture business and how you came to found Foundry Group? 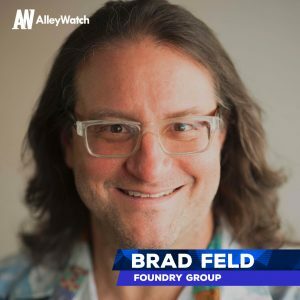 Brad Feld, Foundry Group: I was a Founder of a company in the 1980s. It was a self-funded business; I sold it in 1993 to a public company. After the acquisition, I stayed with the public company for a time, but while I was there I made 40 investments as an angel investor with the money I’d made in the acquisition. In 1996, I accidentally ended up working with a group affiliated with Softbank, which is a large Japanese company that at the time was just starting to make investments in the US. A group of us ended up joining together and created a firm that spun out of Softbank. That was the first venture fund I was part of; it was called Mobius Venture Capital and it got started in 1997. Wind the clock forward a decade, we had a lot of ups and downs with that firm. In 2006 I did two things: one was, I cofounded Techstars, and the other was with a group of partners from Mobius we decided to start a new venture fund, called Foundry Group, which raised our first fund in 2007 and we’ve been investing together ever since. You mentioned there were a lot of ups and down with Mobius. For the aspiring fund manager, what were your most significant lessons learned or what did you decide to do differently with Foundry? In a lot of ways, Foundry Group and the strategy we pursued is a result of many things we did wrong at Mobius, or that we learned from our experience at Mobius. In the context of Foundry, if you look at the things that were our guiding principles in the beginning, we decided to have a very clear strategy for what and how we were going to invest and then stick to that strategy for a long period of time. As part of that strategy we had a number of deeply held beliefs that we solidified at the beginning, at the creation of Foundry Group. Those deeply held beliefs were things like, we would only invest in companies that were within our themes. That while we would invest all over the US we didn’t physically have to be close to the companies we were investing in. A part of our strategy that we described as being “syndication agnostic,” that is, we were happy to co-invest with other firms but also happy to do things by ourselves. It was a series of things like that we realized were important to us when we reflected back on Mobius. That said, I think the clearest for us was to have a consistent long-term strategy around the types of companies we were investing in, and an easy way to make those decisions. Another big part of that was, at Mobius, the organization grew very significantly, while at Foundry Group our plan was specifically not to grow. We don’t have any associates or principles or EIRs on our team, it’s just the partners just making investments. You wrote the book (and blog) on Venture Deals. Of the pitches you see and negotiations you participate in, what are the classic mistakes you still see entrepreneurs make? I think a lot of entrepreneurs make a handful of typical mistakes over and over again. One is, form over substance. You get these very well-crafted, pretty pitches or presentations or documents, but you don’t really get the substance behind what the company is doing and how they’re doing. Another classic mistake is that entrepreneurs don’t focus on answering the question of what they do and why I should care, quickly. A lot of times it’s not even addressed or gets addressed with endless buzzword soup, which is not terribly useful. 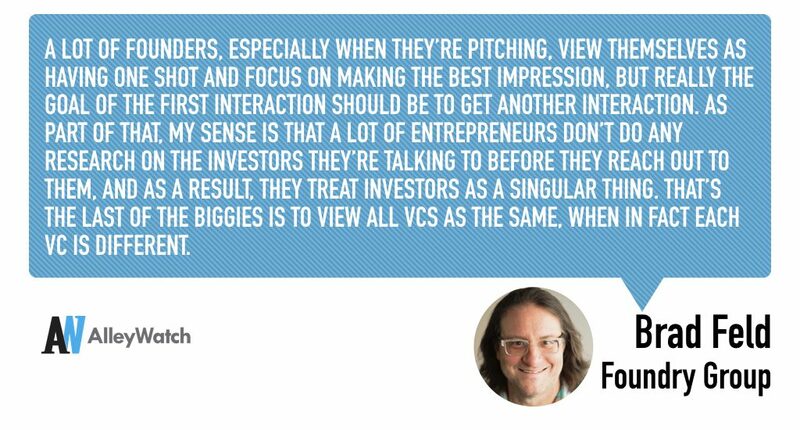 A lot of founders, especially when they’re pitching, view themselves as having one shot and focus on making the best impression, but really the goal of the first interaction should be to get another interaction. As part of that, my sense is that a lot of entrepreneurs don’t do any research on the investors they’re talking to before they reach out to them, and as a result, they treat investors as a singular thing. That’s the last of the biggies is to view all VCs as the same, when in fact each VC is different. In a recent blog post you mentioned how you’ve been witness to the “annual cycle of the hot new thing.” Let’s look at it from the other direction – what area/s of the tech ecosystem are you excited about that are most under-hyped? I don’t have a good answer for that, because I don’t think about it that way at all. We defined, at Foundry, a set of themes we think we can invest in for 20-30 years. Our focus on those themes is that we’re investing in areas where interesting and important, significant companies can be built for a long period of time around these themes. As a result, we don’t really care what’s hot or what’s not hot in the context of any point in time, because the lens that we’re using is orthogonal to that. You’ve written numerous posts about maximizing productivity – is there one productivity hack you’d encourage your entrepreneurs to implement? Is there one that moved the needle the most for you? Making sure that you have time for yourself to actually think and concentrate on what you need to get done, rather than be always dealing with the tyranny of the urgent. I would posit that that’s a really hard one for entrepreneurs, or at least that it’s an easy trap for entrepreneurs to fall into – to focus on the urgent. Do you agree with that, and if so, are there specific mechanisms you’d prescribe to help break that cycle? I think that for the entrepreneur it changes over their own experience as well as the stage of the company. It’s really important to figure out a rhythm that works for you at whatever stage of your company you’re at that allows you to do all that you need to do in terms of management and leadership of the company, while still giving you some space. I think the entrepreneurs who struggle the most are the ones who have no space, and they’re always in an over-commit cycle and they can never scale back and look at what’s going on. The other side of it is that many people go through lots of different tools and techniques to try to manage their time. There are lots of different approaches. I think the key is to find something that works for you and stick with it. I’ve seen so many people who are constantly experimenting to the point of not really being effective with their time, because they’re constantly changing what those things are, versus developing a pattern and then having other people know your pattern is so it starts to look predictable. You mentioned that Foundry Group invests across the US. How would you assess New York’s position in the national tech ecosystem? What do we do well and what do we need to improve on? New York is a very important part of the overall US startup community. We’ve always had a lot of investments in New York. The dynamics of company creation and the types of companies that have been created have ebbed and flowed over time. The current reality is that there’s a very broad diversity of talent, there’s a lot of funding, and there are many people who are attracted to New York as a place to live, so it’s a good attractor for people who want to build new companies or join fast-growing companies. I think one of the weaknesses – and I wouldn’t categorize it as just New York, many of the more visible startup communities seem to share this orientation – is the view that it’s a zero-sum game; that New York must win and Boston must lose. That may be valid in baseball but I don’t think that’s a healthy way to think about a startup community. If you’re a New York-based companies, one of your easy expansion points, a place you’ll have a lot of collaboration with, a place where you’ll quite possibly have lots of customers, a place that’s a good recruiting base, is, for example, Boston, so you’re going to want Boston to be vibrant. So it’s not a we-win, you-lose model. A healthier approach, I think, is to say we’re building something special here, and we’re collaborative with people in lots of parts of the country and lots of places in the world. A very vibrant startup ecosystem has sprouted up in Boulder, CO, which of course isn’t a major metropolitan area like New York or Boston or San Francisco. You hear a lot about “the rise of the rest.” What are the key ingredients you would look for in assessing whether an area can play host to a vibrant tech ecosystem? I think Steve Case is doing some great stuff with his “rise of the rest” message and the activity around it. I don’t know if you’ve read the book that I wrote in 2012, Startup Communities? If you haven’t, I’d encourage it. In 2010, the thing that inspired me to write the book was that entrepreneurship was starting to become visible again in the US, people were starting to become excited about it. Effectively there were four cities being talked about as the up and coming emerging leaders of this next wave of entrepreneurial activity, and they were the Bay Area or Silicon Valley, Boston, New York, and Boulder. One of those things is not like the others – Boulder’s entire city would practically fit in an office building in downtown Manhattan. We’re a city of 100,000 people. We happen to be 30 minutes from Denver, but they’re very different cities. It inspired me to think a lot about startup communities, and it inspired me to write this book with the message that you can build a vibrant startup community in a city with 100,000 people. And not just that, but that actually it’s a requirement for the long-term health of the city to have a vibrant startup community. In the book I had four principles, which I called the Boulder Thesis. The first is that the leaders have to be entrepreneurs, everyone else who participates is a feeder and they support the activity of the entrepreneurial ecosystem, but in the absence of entrepreneurs nothing will happen. Third is you have to be inclusive of anyone who wants to engage at any level. And fourth is you have to have continuous activities and events that engage people in the act of entrepreneurship, things like Techstars or Startup Weekend – not just cocktail parties and gatherings, but places where people cluster around the creation of new companies. Today, those things don’t sound particularly breakthrough, but in 2012 they were a totally new way to think about how to build these startup communities, and I would like to suggest that startup communities and many of these principles are being used not just in the US but around the world to build long term startup communities. Amid this summer of discontent for women in the US tech ecosystem, Foundry Group released a blog post entitled Our Zero Tolerance Policy on Sexual Harassment, which is well worth a read. In light of recent events, how do you assess the state of women in tech, and how have recent events impacted your work as a VC – whether in terms of investment decisions, guidance given to founders, your own institutional design, etc.? I’d suggest the issue of diversity broadly, and gender diversity specifically, is something that my partners and I have been focused on for a long time in our actions and the way that we behave. If you go back to the comments I made a few minutes ago from 2012, principle three of the Boulder Thesis is that you have to be inclusive of anyone who engages at any level, and “anyone” means on any vector of diversity – not just gender or ethnicity or race, but sexual identity, educational background, geographic background, immigration status, etc.. You want a very broad range of inclusivity in your startup communities. 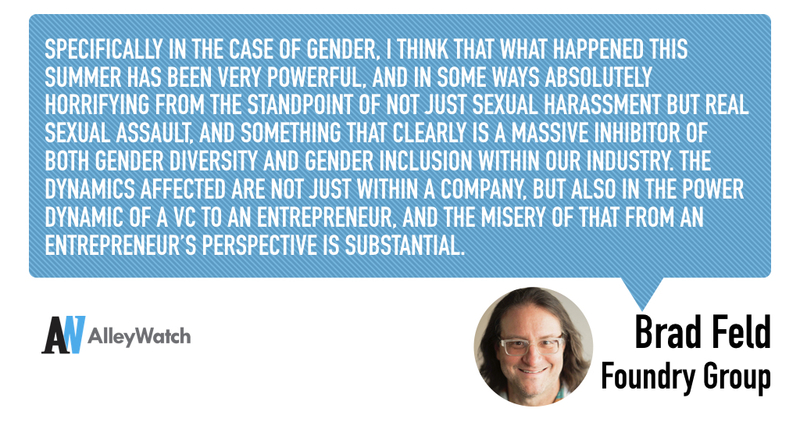 Specifically in the case of gender, I think that what happened this summer has been very powerful, and in some ways absolutely horrifying from the standpoint of not just sexual harassment but real sexual assault, and something that clearly is a massive inhibitor of both gender diversity and gender inclusion within our industry. The dynamics affected are not just within a company, but also in the power dynamic of a VC to an entrepreneur, and the misery of that from an entrepreneur’s perspective is substantial. It’s generated a lot of discussion and a lot of introspection, but also some specific activity and some change. What I would consider is that change is a continuous spectrum, where you don’t necessarily have a dramatic change overnight, though there was some of that, but you get a steady wave of it. It’s something that I’ve been experiencing and involved in for a long time. I’ve been involved with an organization called the National Center for Women & Information Technology, which is focused on getting more girls and women involved in computer science. Over the 12 years I’ve been involved in that organization, I’ve seen incremental but cumulative changes on attitudes and perspectives and understanding, both around discrimination and bias, and on what helps versus what hinders. I go back to having a long-term view. I’d like to believe this issue is no longer an issue, that specifically gender diversity but more broadly diversity in general is not a problem in entrepreneurship, in tech, in the US, but there’s no question it’s a big problem today. For the avid reader, which one book of fiction and one book of non-fiction should they start with (Brad Feld’s bookshelf is available on Goodreads)? It’s always interesting to have to do one because I’m a very prolific reader. What I’ll do is highlight one fiction and one non-fiction that’s relatively recent. I think that a book that was very stimulating to me, that was non-fiction, is a book called The Curse of Cash, by Kenneth Rogoff. It was particularly stimulating in the context of cryptocurrency, of Bitcoin and Ethereum. Another book I think is important and is non-fiction, but was one of the most memorable books I read this year, was Option B, the book that Sheryl Sandberg and Adam Grant wrote. Part of the reason that book was so powerful for me was really because of how Adam helped Sheryl draw out her story of how she dealt with this very tragic event. For me, it comes in the context of, I’m 51 and have had several friends die this year and have several more who are ill, and so it seems much more relevant to me this notion of mortality and trying to process it. The fiction book would be Neal Stephenson’s most recent book, The Rise and Fall of D.O.D.O. I’m a huge Neal Stephenson fan; he’s become much more accessible in his last couple of books. His previous book, Seveneves, was also an outstanding book. You’re such an admired figure in this industry, I wonder if there’s an investor who you really admire? Many, and I have people who I consider extremely close friends and also very impactful mentors. Two of them come to mind straight away. The first would be Fred Wilson, who’s extremely well known at Union Square Ventures in New York. Another person who may or may not be as well-known but who I consider one of the people I’ve learned the most from is a guy named Ron Fisher. I categorize Ron as one of the mentors who really had a huge influence on my investment thinking early. He’s been at Softbank for a long time, and when we started that first fund I wouldn’t have made any progress as a VC without being exposed to Ron and having the chance to learn from him. Is there one unique or iconoclastic view you have for how the world will be different in 20 or 30 years time? I think the machines have already taken over – they’re just very patient because they have very long duty cycles. They’re letting us enter all the data into them rather than having to figure out how to do it themselves. My view is that society as we see it today will be unrecognizable in 30 years. I don’t have any idea what it will be, I’m not a predictor, I don’t participate in “what are your predictions for 2018 surveys” and stuff like that. But I do believe that the intersection between man and machine, however you want to characterize it, is going to be inextricably different than anything we can currently envision. Judging from your bookshelf, I gather you’re an avid tennis fan. The US Open is underway [this interview was conducted prior to the Men’s Quarterfinal and Women’s Semifinal] – who do you like on the Men’s and Women’s sides? I’m a huge tennis fan, my wife and I both love tennis and have been to the US Open many times, though we haven’t been in several years. I’m a huge Federer fan. I’m hoping Roger pulls through. Amy is an enormous Nadal fan, she refers to Nadal as “my guy.” Disappointingly they’ll probably meet in the Semis, it’d be really fun if they met in the Finals, but we can blame Andy Murray for that. I would say number one would be Federer and number two would be Nadal – if either of them makes it to the Finals that’s who I’ll be rooting for. On the women’s side, I love CoCo Vandeweghe, I think she’s awesome. I got to see her at the Australian Open last year, and I just watched her this morning as she won a tough match where she was the real underdog. I think she’s got awesome spirit and I hope she goes all the way. Have you been to all four Grand Slams? I haven’t been to Wimbledon. I went to the Australian Open with David Cohen from Techstars, we had some stuff to do there so we scheduled it around the Australian Open. I saw the semifinals there and stupidly didn’t stay for the finals. I’ve spent a lot of time in Paris because Amy really likes Paris, but I’ve only been to one day of the French Open, so that’s a miss on my part. At some point I’m sure we’ll spend a longer time there. Next Descartes Revisited: Do Robots Think?